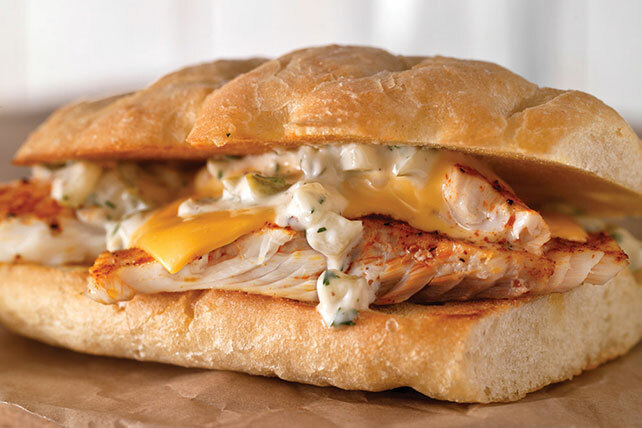 Tender tilapia fillets topped with chopped fresh dill and garlic aioli make a "dill-icious" filling for this sandwich-for-two. Place fish on rack of broiling pan sprayed with cooking spray; sprinkle with paprika. Broil, 4 inches from heat, 5 min. or until fish flakes easily with fork. Meanwhile, combine next 3 ingredients. Place fish on bottom halves of rolls; cover with Singles, pickle mixture and tops of rolls. Prepare using French bread rolls.